While doing a little spring cleaning around the house, I stumbled upon my copy of Baked: Explorations and decided to flip through the pages (mostly because I was procrastinating.What else is new?). I’ve made quite a few recipes (ahem Malted Waffles & Farmstand Buttermilk Doughnuts) from the book…and yet I keep coming back for more. I find all of their interesting combinations incredibly alluring. What was the hook that brought me back? A cake for the cookie lover– also known as this Oatmeal Chocolate Chip Cake with Cream Cheese Frosting! A cake that will tame the cookie & cake loving voice inside your head that tells you YOU MUST HAVE CAKE and YOU MUST HAVE COOKIES and you MUST HAVE THEM RIGHT NOW. This voice & I go way back. Problem is this voice always wants both. Now this voice is like…Cool Tracy…This will tide me over. Now get me another slice. Make it an edge piece. What other two awesome things can we combine? Melted Cheese & Tater Tots? Cool. Cool. 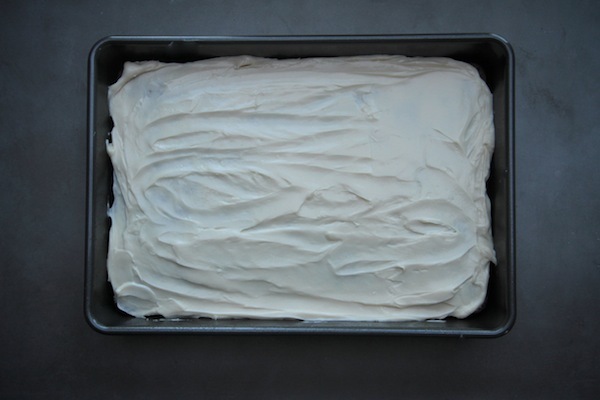 This cake is super simple to prepare. 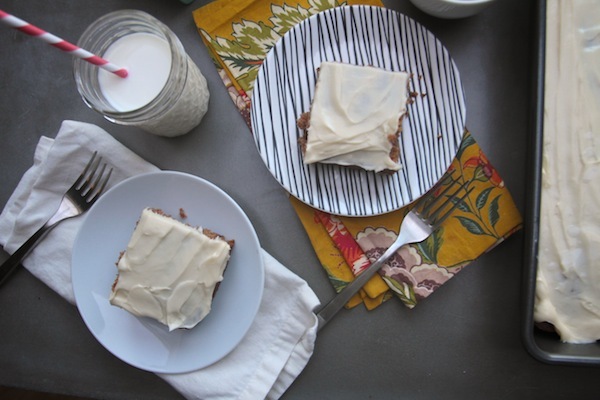 At first you think you’re eating carrot cake (cream cheese frosting!) and then you think you’re eating banana bread and suddenly you bite into a chocolate chip and there it is…something cookie and cake-like. A cake that tastes like cookie! It should be made & eaten on only days that end in Y. And we’re off! Get your ingredients together. 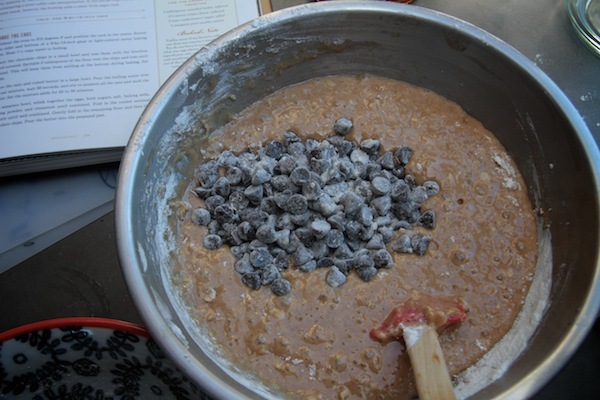 First we take the bourbon and mix it in with the chocolate chips. Now we add flour on top, stir and set aside. This prevents the chocolate chips from sinking straight to the bottom. Any excuse to use bourbon is cool with me. Here’s a cool step. 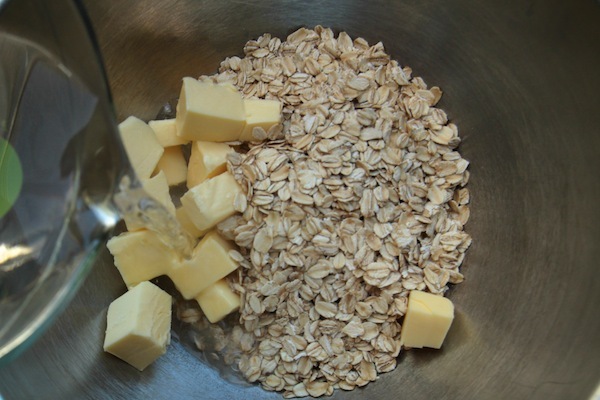 You melt the butter with the oats with hot boiling water. Let it sit for 30 seconds. Then stir and let it sit for 30 minutes to cool. This add a little bite to the cake. So after about 30 minutes we’re going to work on the cake. Eggs & sugars get mixed. 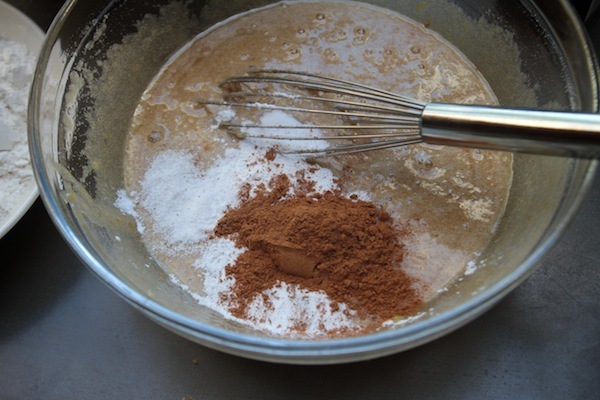 Add in salt, baking powder, cinnamon & baking soda. STIR. 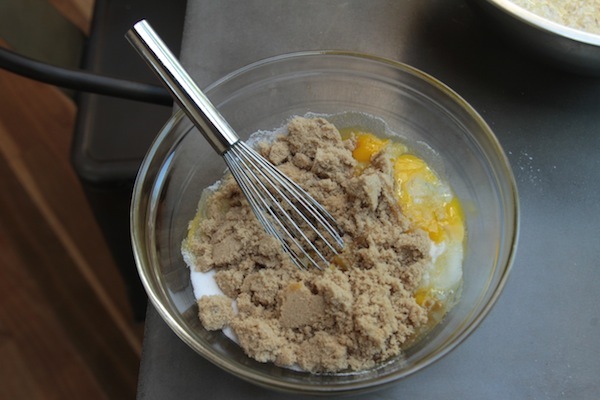 Merge the egg/sugar mixture with the buttery oatmeal. Stir. Now add in the flour. Stir. The chocolate chips get folded in and we’re ready to make cake! 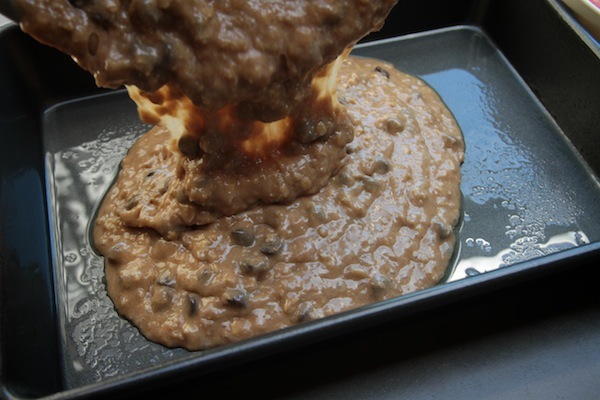 Pour the batter into a prepared 9 x 13 pan. Let’s get that cake in the oven. Cake is done! Let it cool. Dude…be patient. Now we get on with the cream cheese frosting. Cream the butter & cream cheese. Add in the confectioner’s sugar & vanilla. BEAT. 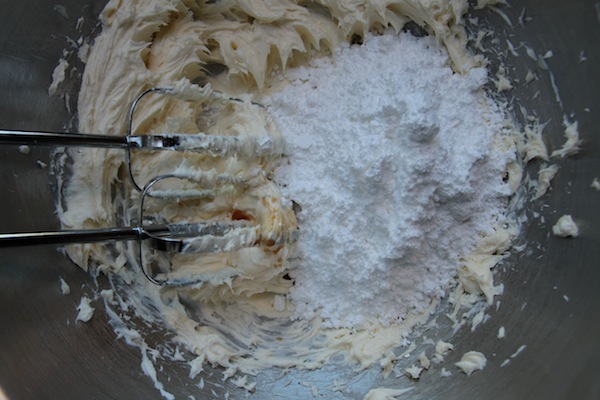 Transfer the cream cheese to the top of the cake. Spread it out! Really lather it on. This is RELAXING, isn’t it? Cut out a few pieces. Get that fork in there. 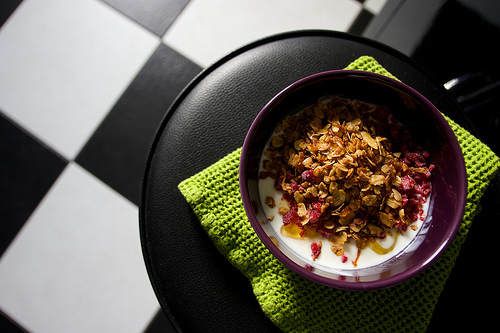 Serve it with some milk or coffee. Weep a little…cuz it’s SO DANG GOOD. 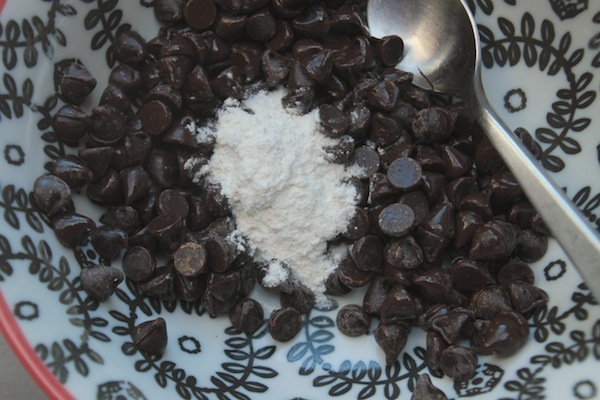 Toss chocolate chips with bourbon in a small bowl. Sprinkle 2 tablespoons of flour over the chips and toss until coated. Set aside. Wow, these look sooo good. Except I’m depriving my thighs right now so I’ll have to hold off on making them as long as that bit of willpower lasts. Wait, it has oats, so must be totally healthy… Right? 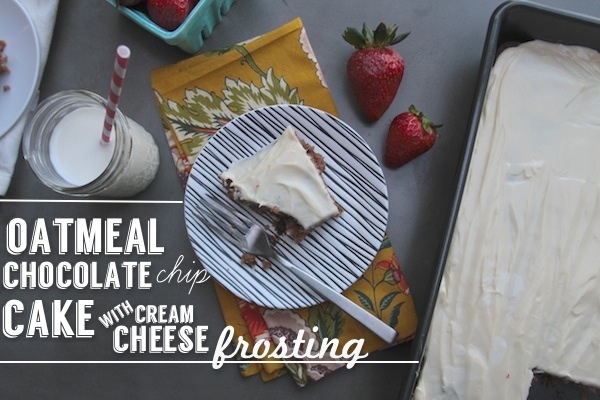 Oatmeal, chocolate, and cream cheese frosting…three of my favorite food groups. This looks delish! What can I substitute for the bourbon? You can totally use water. 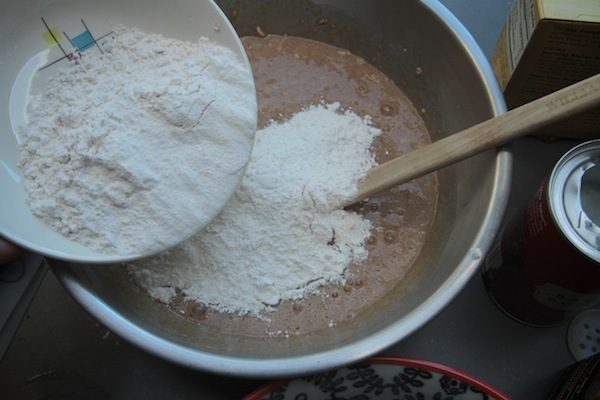 It’s just to help adhere the flour on…but it adds a subtle liquor element. Thank you! In the middle of mixing it up now !! “It should be made & eaten on only days that end in Y.” Hahaha. Made my morning. 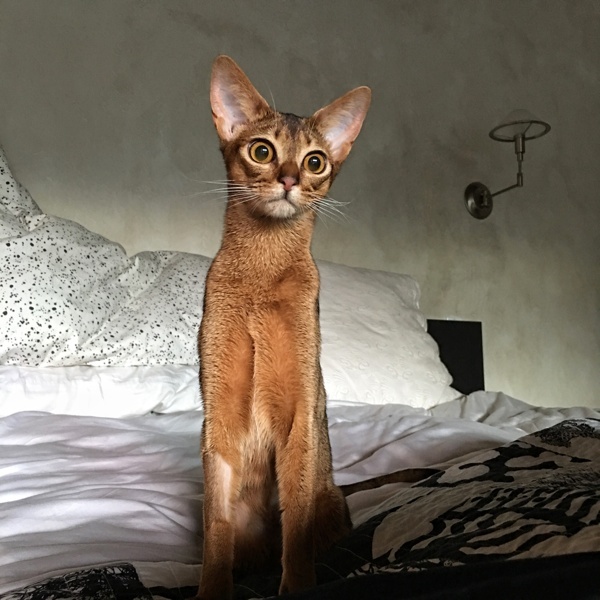 Now I get your Instagram photo! Cooper ate the frosting and left the cake! He’s my kinda boy – I’m a glutton for the frosting too! Sweeeeeet! Does this count as oatmeal for breakfast? Seems legit. I totally just laughed out loud at that comment “on days that end in a Y”. I started saying the days out loud to see which those would be, and then I figured it out. 😉 Totally agree with you on that one. 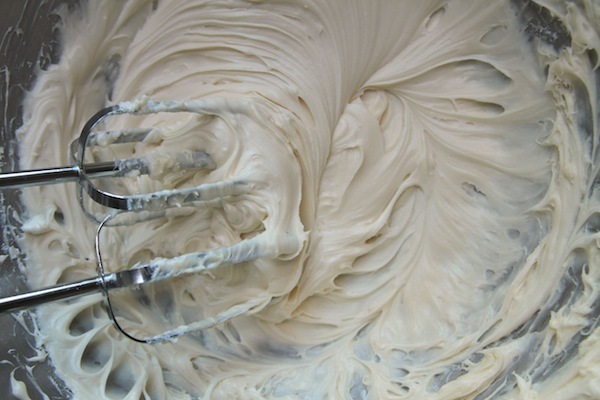 That batter, and that frosting…..I don’t think I could wait to cook it! I’m so glad the hook brought you back… to that book! This recipe looks dangerous. I need it now! I actually think I have everything to make this today. I just have to wait for my ingredients to come to room temperature. You’re on your way to deliciousness. Oh my word. Best. Cake. Ever! Right??!!! Good signs that you need to make it. I can tell that this cake would become a “dish soap pastry” reaaaaaally fast. Yum! HAHAHAHAHA. EXACTLY THAT. It’s a good thing I have company this week or I’d be in major trouble. this is one of my absolute favorites from their cookbook!! thanks for reminding me I need to make it again ASAP. I need this NOW! It’s ok to eat all of it before lunch, right?! 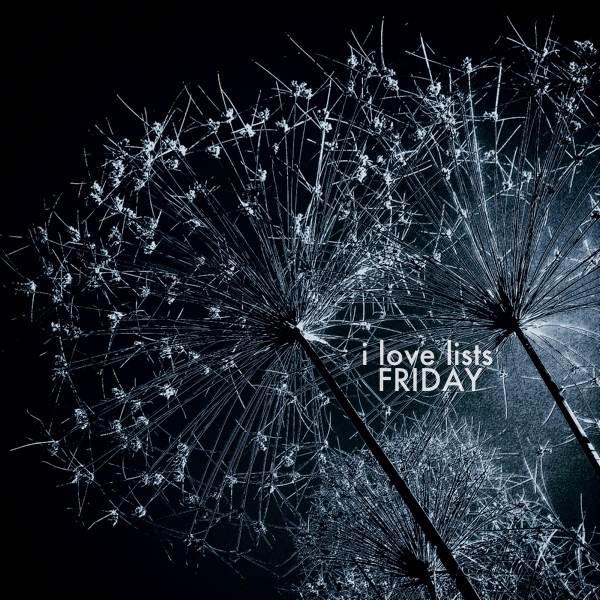 Love your blog, Tracy! Just started listening to your podcast as well. In other words, I’ve been extremely un-productive the last few days. Keep up the great work! YUM FACE. Can I have some like, NOW? Looks so good! 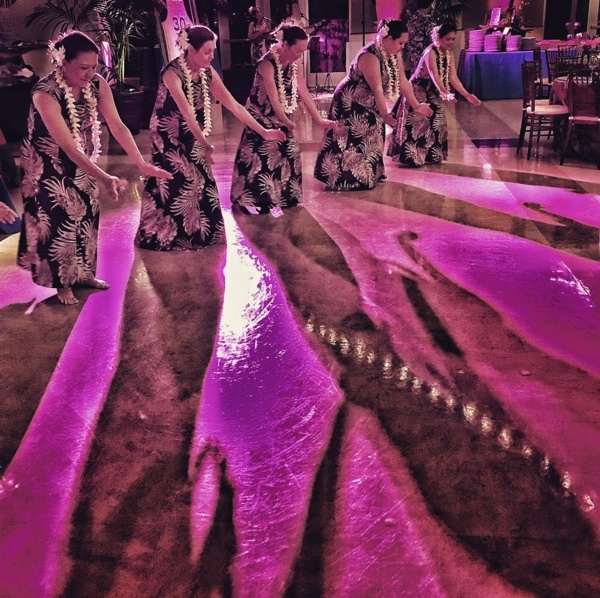 Love your true-to-life photography – always so fun to look at. I love the photo of Cooper digging in paying no attention to you, exactly what I’d be doing. This looks like a delightful cake! Yep, this is a good recipe. Now I need to bake it again! Baked boys have some great recipes. I highly recommend all three of their cookbooks!! I suppose you could, but the taste might be a little off. Trust me, I’d rather do full fat. Heh. 🙂 I’m gonna give it a try with low fat. 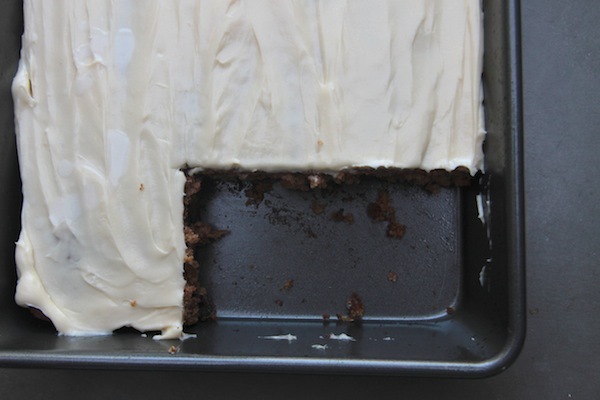 Granted…I’ll eat just about nething topped with cream cheese icing, these cake is genius. I love oatmeal cookies, but also love the moistness of cake. That means, I’ll be making this cake quite soon! We must be on the same brain wavelength! I just got this book from the library and bookmarked this recipe to make. Looks amazing! Yum! 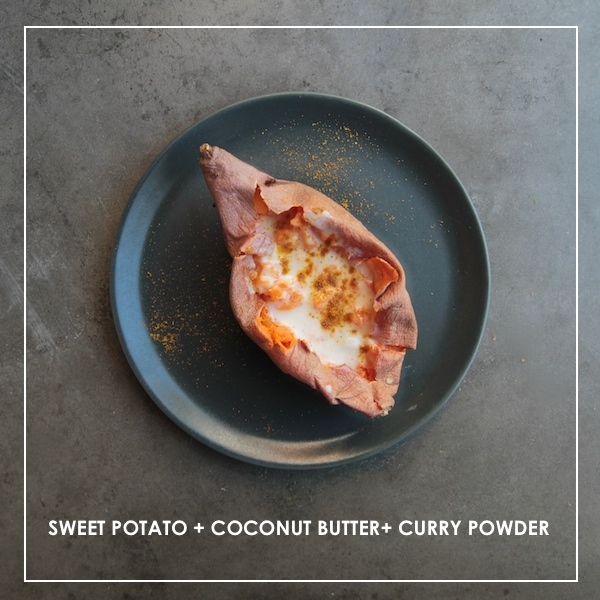 Made this last night – darn good and so easy. Just one comment for others – not sure why but it took mine MUCH less time to bake than suggested – about 20-25 minutes. Also I accidentally bought the large chocolate chips – not sure if that’s why they all sank to the bottom. Doesn’t really matter – still tasted amazing! This looks so delicious! I love your photos too! This is the second recipe I have made from you (i’m a new reader), I’m sold, woman! You inspire me to really enjoy my food! This cake is happening today. Every ingredient is calling my name. 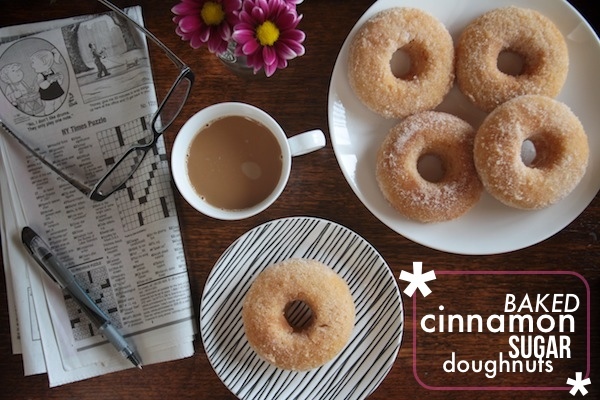 There is breakfast for dinner–well now we have dessert for breakfast! The cake is baking in my oven and my house smells absolutely divine! A perfect, old fashioned cake. Sometimes I get tired of sprinkles. This is in my mouth right now… delish. Fyi, in the oats/butter paragraph, it says to “Seat aside for 25-30 minutes.” I think that should be set aside? correct. sorry for the typo. my hands move faster than my brain sometimes. Thanks for trying the recipe! No need to apologize!! You’ve done a great service sharing this recipe. 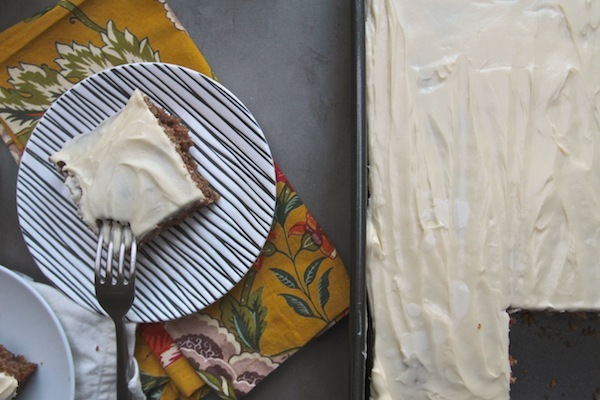 Everything I love + bourbon + frosting brought to life with your gorgeous pics. Yum. I’ve made a few recipes from their other book, Baked, New frontiers in Baking but I’ve yet to flick through this book. Maybe I Should I do so very soon if this cake is to go by. It looks really good Tracey. you HAVE to check it out. It’s super! I’ve looked at this recipe so many times with the intention of making it but your post finally convinced me I need to GET ON WITH IT already!!!!! This is my first visit to your beautiful blog, as I was looking for feedback re this cake. 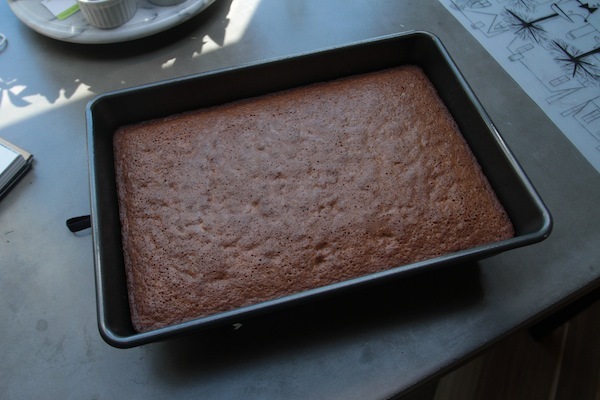 I’ve received Baked Explorations a couple weeks ago and tried this cake last week, using quick cooking oatmeal. It came out great, a bit less moist than I have expected. I was wondering- have you used whole (old fashioned) rolled oats? From the picture they seem thicker than the instant ones. I used rolled oats. Yes! It gives it a really nice texture. I highly suggest doing so! Holy heck. I made this yesterday. IT IS SO DANG GOOD! 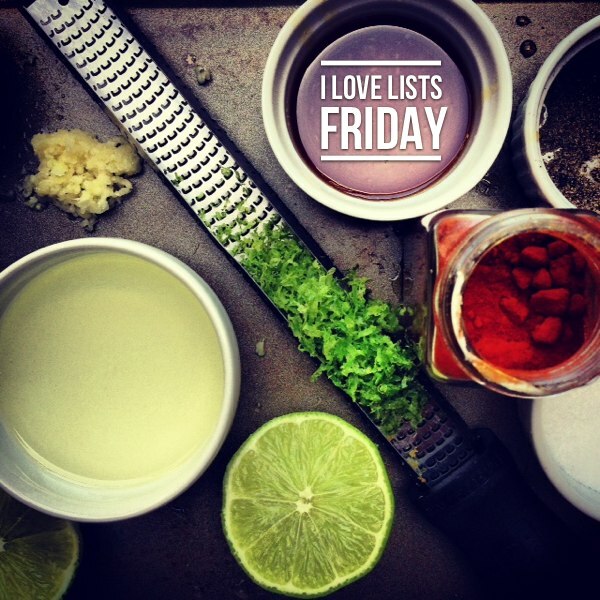 I love your blog and I’ve made several of your recipes that have been fabulous!!!! I wonder if your oven isn’t reading the temperature correctly. It sounds like it was overcooked! You should get an oven thermometer and test it out. What a shame! I’m so sorry that happened to you! I’m going to try again this weekend because, despite being over baked, it was YUMMY!! Your blog is so wonderful and it makes me think of home every time I see your pictures of Marin and SF. I don’t live in California anymore and your pictures always make me happy and nostalgic! Thanks for your advice and a fabulous blog!! Wow this was good! I used Kahlua instead of bourbon for the chocolate chips cause that’s what we had on hand and it worked just fine. 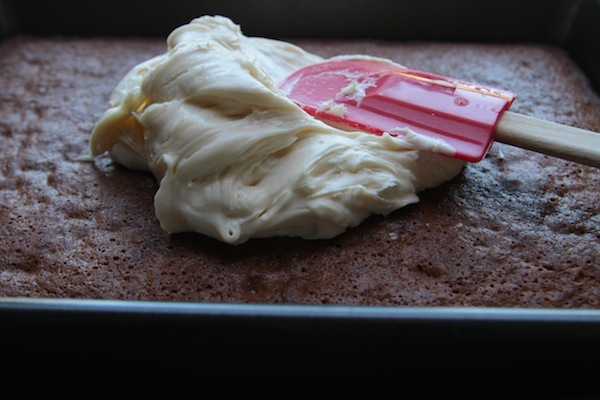 I think I’ll put a thicker layer of frosting on next time – hard to go wrong with cream cheese frosting on anything. So good! I’ll definitely try that next time. I love cream cheese too! I use it for my blueberry + cream cheese + ice cream waffle recipe. I have never experimented with the cream cheese before but I think this is the time to do so! 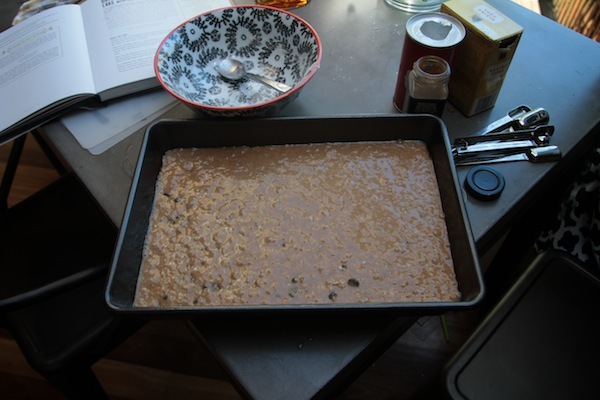 I’ll be trying this oatmeal chocolate chip cake recipe once more with a little tweak with the cream cheese. I’m thinking of adding vanilla and raisins to it..
I’m so excited for this experiment. I’d love to add raisins or craisins to this. Do you think I’d need to alter any other ingredient? 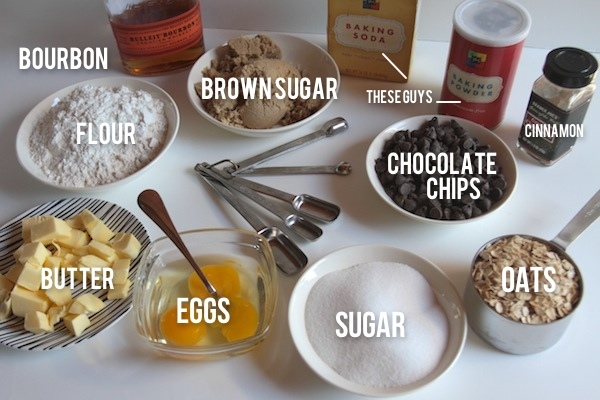 In addition to the chocolate chips or instead of? I think it would work either way! 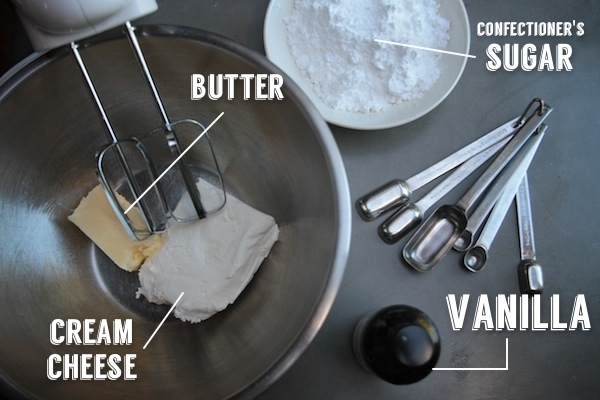 Cream cheese or cream cheese frosting to make the frosting? HAHAHA. Just cream cheese. Sometimes my hands have a way of taking over when I’m typing. Um, can I just say that I appreciate that this is under the “breakfast” category of your recipe index? You’re speaking my language, girl. Even without the icing it´s just amazing. May I ask your permission to link you and translate the recipe to spanish? The world just need to knows! I just made this today and it is delicious! For some reason, I baked it in a 9×13 pan the cake sank a little bit in the middle and my layer of cream cheese frosting didn’t quite cover the cake as well as yours. The frosting recipe worked out great though. Nice thickness and I think the chilling helped thicken it so it wasn’t too runny. I baked it in one of those disposable aluminum pans and it was done in 30 mins. Bizarre! Sounds like something might be up with your oven! Also- perhaps you didn’t spread the frosting evening? I also baked it in a 9×13 pan and it did the exact same thing! I sure hope it’s not my oven. 🙁 I probably should have doubled the frosting to give an added thickness but it was delicious otherwise! I am mid-way through my first piece of this bad boy and oh man is it good! This was my first cake (ever!) from scratch and it came together beautifully. 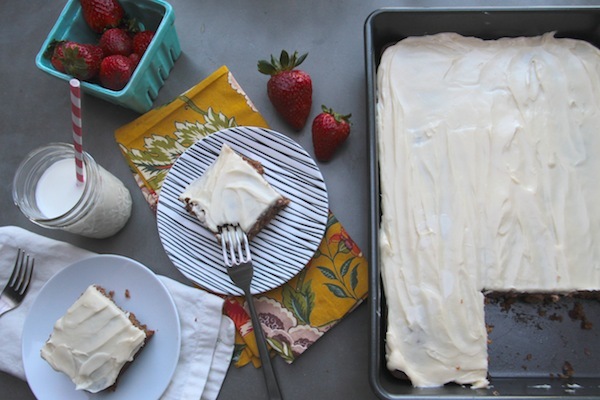 I made a little extra frosting for an extra-thick layer ( and for dipping strawberries into… do this.) and I’m so glad I did. Thank you Tracy for this phenomenal cake that totally satisfies a cookie-lover like me. I have loved everything I’ve tried from your site so far (that arugula hazelnut salad? oh man) and don’t even get me started on the awesomeness that is the jtb podcast. You rock! YOUR FIRST CAKE?!!! OMG that’s awesome!!! Thank you so much for trying this recipe. The whole world of cake is yours now! I am mixing this up right now and I’m to the point of adding the remaining flour. I don’t see the measurement for flour other than the flour added to the chocolate chips. Am I blind? I suppose I can wing it, but I would appreciate that measurement if anyone has it. Thank you anyways, but I am blind…my 7 year old just pointed the measurement out to me. This is one dangerous dessert! I was supposed to be starting my new workout diet tomorrow but it may have to be delayed…. 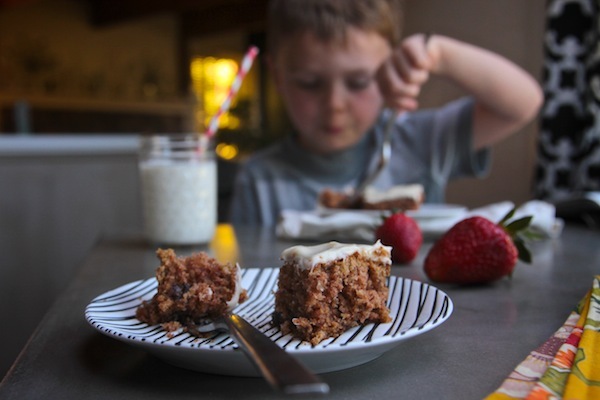 I have been searching for this recipe for a few weeks now so thank you so much…I made the cake last night for my small family of three and it’s almost gone. We don’t eat a lot of sweets so I figured this may last about a week but I was wrong…my hubby is even taking some to work with him and he never does that with desserts. Thanks again! I meant to tell you I used butterscotch chips since we like them better and it was awesome! I bet this cake would be amazing with coconut-pecan or chocolate frosting! Tracy, All I can say is that it took everything in me to not just eat the bowl of oats and butter while it was resting… Pour a little salt and sugar/cinnamon mixture on it… Oh my. My heart rate is beating a little too quickly as I await the timer going off for this cake… Yummy! What a fantastic cake! Made it for a friend’s birthday last weekend and we were all so pleased. I used half whole wheat pastry flour and half all purpose in the cake and Neufchatel in the frosting. This recipe’s a keeper. Tracy, Do you think it would work as a stacked cake in two 8 inch round pans? I think it could. Keep an eye on it when it’s baking! Erin, did this work? I’m thinking about turning this into a layer cake and serving it for friendsgiving!